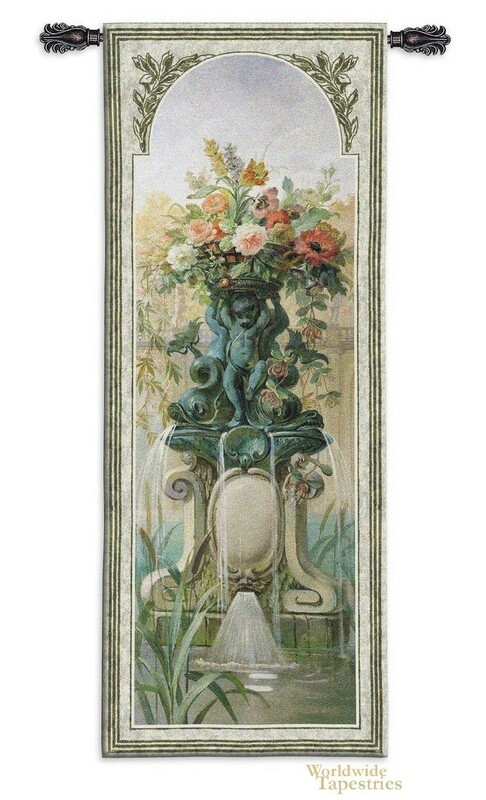 Scenic Panel II tapestry shows a beautiful classic garden with fountain and flowers. Here in this elegant work which exudes beauty and refinement, we see a lake like pond with a central fountain of cherubs. Lush plants are seen in both the foreground as well as behind in the pond itself, with a hint of bushland beyond. An exuberant collection of flowers sits above the fountain in a multitude of colors to decorate the scene. This beautiful work stirs the senses as well as the imagination as it leads us into this scene and the world it inhabits. The balance of color and the play of light is exceptional in this work. Scenic Panel II tapestry is backed with lining and tunnel for easy hanging. Note: tapestry rod and tassels, where pictured, are not included in the price.